The lesson from the Barnes & Noble experience is that the overall marketing strategy, rather than new technologies, defines the trouble with technology. Management took their eye off the fundamental function of the retail experience, i.e. to move customers to the transaction. Never mind the esthetics of the decor or the company’s nod to electronic publishing. At the end of the day, they lost my business because they made it too complicated and frustrating to get to the purchase. They overlooked that it’s not the technology that consumers want from traditional stores, but the speed and convenience of new technologies with the creature comforts they associate with in-store shopping. Marketing Semiotics relates new technologies to emergent consumer needs in the marketplace, enabling marketers to integrate changing consumer expectations into traditional retail settings. This means that technology per se is not as important for marketers as the behaviors these technologies motivate in consumers. For example, on-line shopping has created greater consumer demand for speed and convenience, a demand that shoppers bring into the traditional retail venue. Barnes and Noble neglected to update the in-store transaction in line with contemporary technologies, deepening the divide between on-line shopping and the store, and sending away customers looking for a quick and convenient way to make the purchase. A Game Changer for Consumer Choice. This case also sheds light on the kinds of events that may motivate actual changes in consumer behavior in response to changes in retailing technology. For example, my frustration with the service and purchase experience at Barnes & Noble formed a kind of tipping point for changing my book shopping behavior the following year. For Christmas shopping 2012, I bypassed the store altogether and purchased books, gift wrapping, and shipping at Amazon.com from my mobile phone, while traveling to a client meeting. I cannot emphasize enough that my change in behavior was prompted primarily by poor customer service in the traditional retail setting, not by the appeal of the on-line shopping experience. 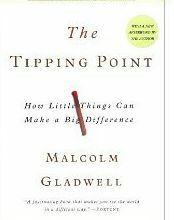 The Barnes & Noble case supports Gladwell’s point that the little inconveniences or interruptions in customer service can build up to the final “tipping point,” where customers are almost pushed into a change in consumer behavior. In other words, it’s not the trouble with technology, but with the mismanagement of the cultural factors associated with technology as it relates to the brand.